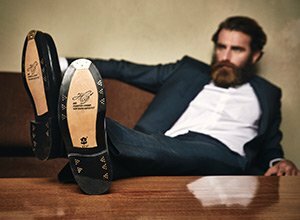 Our founding duo set out with a shared vision: of cost-effectively designing and producing high-quality men’s shoes, to be sold to fellow shoe lovers. With the help of a few other key players, they launched the SHOEPASSION.COM site in a little under two years—the first packages they distributed were still wrapped in a silk ribbon, stamped with a wax seal, and delivered to the post office by hand each day. Today, our international team numbers over 30, yet we’ve retained the essentials from our early days. We still pride ourselves on our friendly work environment, our passion for shoes and their cultural significance, and our sensational prices—everything else is bigger and better than before. Whether it’s the design and programming behind our site, our detailed product descriptions or our comprehensive shoe encyclopaedia, our shoe storage system or our entire logistics structure, our vivid product photos or the expert service in our brick-and-mortar store, all aspects of our business are handled in-house. This is how we guarantee our high standards of quality, reflected in our products and services; other manufacturers rely upon ready-made fulfilment solutions or external service providers, sacrificing proprietary control in the process. We also take an in-house approach to company ownership. Although, like many others, we’re based in »Europe’s startup capital«, we’ve chosen to stray from the beaten path. Instead of accepting venture capital from investors, SHOEPASSION.com pursues the »bootstrapping« strategy, i.e., financing our firm through our own means and classic bank credit. This gives us a definite advantage—SHOEPASSION.com is 100% owner-managed, and our owners in turn are 100% bona fide footwear fiends. Our management isn’t concerned with accruing profits interests »grasshopper-style«. We dictate the direction and the tempo of our company’s development—an honest method that benefits employees and customers alike. We believe that all decisions ought to be made with sustainability in mind. At SHOEPASSION.com, we hold ourselves accountable for each employee. The young people working for us gain solid prospects—they’re encouraged to stay on for the long term, and everyone benefits from a high learning curve. Each of our departments, from Marketing to IT, Graphic Design to Finance, is staffed with experts in their respective fields. Unlike many other startups, we’re not a mere incubator for interns. When we do take on interns, most of them end up staying with us full-time; our trainees work together with our experts to build our future. Outlets such as the Spiegel and the Berliner Morgenpost have taken notice of this unique and sustainable practice—we take this as further confirmation of the strong work prospects we have to offer. We don’t work in a massive, anonymous office space or crammed side-by-side like chickens in a coop. Our office is located in Berlin’s time-honoured Ackerhalle and features open-plan workstations to facilitate transparency and communication. We host communal team breakfasts and post daily on our internal, digital blackboard—each SHOEPASSION.com division knows what the other ones are working on at any given point in time. This ensures that everyone gets a look at the big picture, and that everyone sees themselves as part of a team that can only succeed with everyone’s cooperation. Coffee, mineral water, fresh-pressed orange juice, healthy fruit plates, and even German or Spanish language courses—SHOEPASSION.com offers its team much more than they’d get from a classic nine-to-five job. We often gather in our back courtyard to grill in the evening, or organize team events across Berlin. While in other places people are treated like human capital, SHOEPASSION.com values team spirit above all else. After all, the individual is only ever as strong as the team. For us, it doesn’t matter what you’ve learned, but rather what you’re capable of achieving. We give young talent a chance, providing a supportive environment as well as advice on further advancing the career ladder. We’re also always happy to receive applications.